In the past, the iSchool has been able to provide an Adobe Connect room to every student. Our current licensing model DOES NOT allow us to provide this service and we are limited to rooms for larger events, including student organization meetings, and online courses. If you are an officer in a student organization and interested in simulcasting and recording your meetings please contact us in Online Learning and we can get you setup to broadcast these types of events. 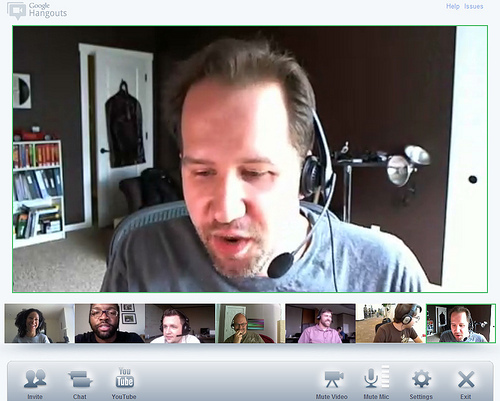 Up to 10 people in a video chat, 15 if you have a paid Google subscription. UW doesn’t currently have Hangouts enabled on our system but we are hopeful that it will be available soon. In the meantime you can still use the regular hangouts. Broadcast live via You Tube to a larger audience using Hangouts on Air. If you would like to know more about Hangouts, or would like to get some training on its use please let us know by submitting a help ticket by filling out the form at http://ischool.uw.edu/technology/helpform. As always, feel free to contact us with your questions, comments or concerns. ← Notice: Welcome to the 2013-14 Academic Year!